FSF guidelines for systems forbids to "steer users towards obtaining any nonfree information for practical use, or encourage them to do so [and should not] refer to third-party repositories that are not committed to only including free software; even if they only have free software today, that may not be true tomorrow." donaldr3 added a comment to T695: [FREEDOM ISSUE] purism-librem-coreboot-updater. Wanted to bump this and check on it, thank you. jonas.smedegaard updated subscribers of T695: [FREEDOM ISSUE] purism-librem-coreboot-updater. jonas.smedegaard claimed T695: [FREEDOM ISSUE] purism-librem-coreboot-updater. jonas.smedegaard edited projects for T695: [FREEDOM ISSUE] purism-librem-coreboot-updater, added: Freedom-harm: downloads potentially nonfree code; removed Freedom. jonas.smedegaard placed T305: Purebrowser: Addons screen links to upstream-distributed addons up for grabs. jonas.smedegaard placed T299: Purebrowser promotes upstream-distributed addons up for grabs. jonas.smedegaard merged task T532: purebrowser: Home screen advertises Firefox brand with links to Mozilla addons service into T306: The Start page refers to the Purebrowser as "Firefox". mak closed T348: torbrowser-launcher - downloads code outside the control of PureOS as "Resolved". mak added a comment to T348: torbrowser-launcher - downloads code outside the control of PureOS. Since this was just mentioned again, I need feedback here... Go, or no go? /me is for dropping it (at least temporarily). jonas.smedegaard added a parent task for T532: purebrowser: Home screen advertises Firefox brand with links to Mozilla addons service: T536: purebrowser - references "Firefox" and "Mozilla" leading to confusion. jonas.smedegaard added a comment to T532: purebrowser: Home screen advertises Firefox brand with links to Mozilla addons service. jonas.smedegaard removed a parent task for T532: purebrowser: Home screen advertises Firefox brand with links to Mozilla addons service: T268: purebrowser leaks data to third-parties. jonas.smedegaard added a comment to T299: Purebrowser promotes upstream-distributed addons. This T299 is now a meta-issue tracking the various ways that Mozilla addons service is getting promoted, and the main issue of the integrated addons support using Mozilla by default is now tracked at T305. jonas.smedegaard renamed T305: Purebrowser: Addons screen links to upstream-distributed addons from "Create separate Trisquel-style add-ons webpage" to "Purebrowser: Addons screen links to upstream-distributed addons". jonas.smedegaard renamed T299: Purebrowser promotes upstream-distributed addons from "Purebrowser 52.5.0esr-1pureos2 recommends non-free add-ons" to "Purebrowser promotes upstream-distributed addons". jonas.smedegaard added a parent task for T299: Purebrowser promotes upstream-distributed addons: T268: purebrowser leaks data to third-parties. jonas.smedegaard added a parent task for T532: purebrowser: Home screen advertises Firefox brand with links to Mozilla addons service: T268: purebrowser leaks data to third-parties. jonas.smedegaard edited projects for T532: purebrowser: Home screen advertises Firefox brand with links to Mozilla addons service, added: Freedom-harm: downloads potentially nonfree code; removed Freedom-harm: downloads nonfree code. @d3vid The promotion of Mozilla addons service via Home screen is now tracked in separate issue T532. jonas.smedegaard added a subtask for T299: Purebrowser promotes upstream-distributed addons: T532: purebrowser: Home screen advertises Firefox brand with links to Mozilla addons service. @james.rufer yes, I did not mean to imply that this issue is not still open (the status in this very issue tracker is "open"). I only meant to ensure that if you had some additional information, that I then did in fact understand what that was. d3vid added a comment to T299: Purebrowser promotes upstream-distributed addons. james.rufer added a comment to T299: Purebrowser promotes upstream-distributed addons. If you go to the hamburger menu and then add ons, you'll see the attached picture. In the past this was directed to a FSF add on page. 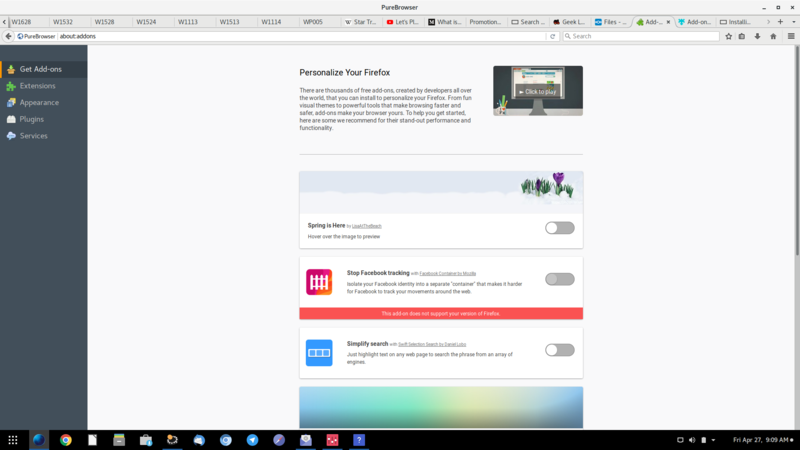 After loading up the most recent build on a test machine without Firefox installed, the normal Firefox add-ons page is shown within PureBrowser. So the original issue remains despite my being incorrect as to the cause. What URL(s) are you talking about? If Firefox is also installed on the system, the PureBrowser FSF add-ons pages becomes the normal Firefox add-ons page instead. jonas.smedegaard added a subtask for T299: Purebrowser promotes upstream-distributed addons: T305: Purebrowser: Addons screen links to upstream-distributed addons. jonas.smedegaard added a comment to T384: cargo - downloads potentially nonfree code. This issue is about following requirements defined by the GNU DFSG. Bug description is now updated to include relevant quotes from GNU FSDG. jonas.smedegaard edited the description of T384: cargo - downloads potentially nonfree code. jonas.smedegaard edited the description of T383: npm - downloads potentially nonfree code. mak added a comment to T384: cargo - downloads potentially nonfree code. Also, every one of these package managers will not download non-free stuff behind the user's back. Like APT itself or a webbrowser, it will download things only if the users has directly requested that. This is impossible, as pretty much all of GNOME, systemd, Xorg depends on Meson, and no Rust code can be built without cargo properly at the moment. mak updated subscribers of T348: torbrowser-launcher - downloads code outside the control of PureOS. @jonas.smedegaard We deliberately added TorBrowser this way when creating PureOS back in the day. I never liked this at all, so personally I would like to remove the package, but I am not sure if we should do that, because the decision to have it that way was done on purpose. @zlatan.todoric should the Tor Browser package be dropped from PureOS? jonas.smedegaard reassigned T348: torbrowser-launcher - downloads code outside the control of PureOS from jonas.smedegaard to mak. Please drop our fork of torbrowser-launcher: It violates GNU FSDG in that we lack control over what code ends on our users' systems. jonas.smedegaard created T384: cargo - downloads potentially nonfree code. jonas.smedegaard created T383: npm - downloads potentially nonfree code. mak closed T278: carton - depends on cpanm which downloads potentially nonfree code as "Resolved". mak closed T277: cpanm - downloads potentially nonfree code as "Resolved". mak closed T278: carton - depends on cpanm which downloads potentially nonfree code, a subtask of T277: cpanm - downloads potentially nonfree code, as "Resolved". d3vid added a comment to T348: torbrowser-launcher - downloads code outside the control of PureOS. Ok, I see what you mean! jonas.smedegaard added a comment to T348: torbrowser-launcher - downloads code outside the control of PureOS. We might get assurance from Tor Project. That does not, however, change the fact that we rely on a third-party for governing our rules, which I find problematic. Indeed I confused the terms. Thanks for spotting - corrected now. jonas.smedegaard edited the description of T348: torbrowser-launcher - downloads code outside the control of PureOS. jonas.smedegaard renamed T348: torbrowser-launcher - downloads code outside the control of PureOS from "torbrowser-bundle - downloads code outside the control of PureOS" to "torbrowser-launcher - downloads code outside the control of PureOS". Or can we get some kind of assurance from the Tor Project about the continued freedom of the Browser Bundle? I think you mean "torbrowser-launcher" above? I suspect the Debian-but-released-only-in-contrib package was done that way due to the slow release cycle of Debian and the need for potentially quick update of the code. If that is the case, then a solution (other than simply giving up and kicking out torbrowser-bundle from PureOS) would be to replace with new package torbrowser - which could be maintained in Debian but there flagged as unreleasable similar to how other fast-moving code like Bitcoin is handled. jonas.smedegaard created T348: torbrowser-launcher - downloads code outside the control of PureOS. jonas.smedegaard added a project to T299: Purebrowser promotes upstream-distributed addons: Freedom-harm: downloads potentially nonfree code. rurban added a comment to T277: cpanm - downloads potentially nonfree code. pip already came up with a decision. see the link above.